The Flyer's first-ever green issue. The Flyer has been around for almost 20 years, and we don't know if you've noticed that green always has been our signature color. But this is our first official "green" issue. Like many people, we've become more ecologically aware in the past few years, probably due to a combination of Al Gore, global warming, and rising energy costs. Around the office, we've tried to make some changes: We've calculated our carbon footprints; we're biking and carpooling to work; we're recycling; and more and more of us are bringing our own canvas bags to the grocery store. Throughout this issue, read about other Memphians who are living and working green and what you can do to join them. And that's important, because MLGW's Becky Williamson says Memphis consumes more electricity per capita than any other city in the nation. That's right — in the nation. But before you ask ... no, this issue is not printed on recycled paper. It isn't financially feasible. But it can be recycled, and we'd love it if you would do so, after you're done reading it, of course. Two area businesses help locals reduce their environmental impact. It's not always easy being green. But some local businesses are helping Memphians make the transition from careless polluters to environmental stewards. Whether it's ridding homes of Earth-destroying toxins or looking for a place to recycle the cardboard generated by a small business, there's a company ready to assist. When Candace Mills started 2 Chicks and a Broom, a Midtown-based house-cleaning service, in 2002, she was buying the same cleaning products she grew up using. "I noticed that my hands started breaking out, and I started having asthma attacks even though I don't have asthma," Mills says. "That's when I realized I was making homes toxic." 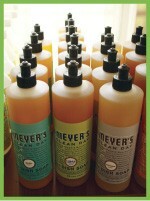 Mills turned to green cleaners such as Mrs. Meyer's Clean Day and Seventh Generation, and the negative side effects disappeared. Green cleaners are made with biodegradable and all-natural ingredients rather than harsh chemicals. Today, 2 Chicks and a Broom only allows the independent contractors who clean for them, known as "chicks" and "chucks," to use environmentally friendly products outlined in the company handbook. Besides the name-brand green cleaners, housekeepers also may use homemade cleaning products. "We use a lot of homemade stuff made with vinegar, baking soda, Borax, or tea tree oil," says Kelly Uhlhorn, a former chick who's buying the business from Mills. They also use washable rags and sponges rather than disposable paper towels to further reduce their environmental impact. Inside the 2 Chicks and a Broom office on Cooper, even the toilet paper is recycled paper. When company representatives meet initially with new clients, homeowners explain any allergies and aromatic preferences. "We walk through the home with them, and we want to know everything — what smells they like, what smells they don't like," Mills says. "Our clients are totally in control of their service. Currently, 28 chicks and chucks share the workload for the company's approximately 800 clients. Most of the cleaners hired by 2 Chicks and a Broom are artists or musicians. And even though the economy is dragging, Uhlhorn says business hasn't slowed. "People are working more because of the economy, and they don't always have time to clean," Uhlhorn says. "And people are starting to come over to us because we're green," Mills adds. "It's time to think of sustainability." Can't afford a home-cleaning service? 2 Chicks and a Broom sells green cleaning products by Shacklee, Caldrea, Mrs. Meyer's Clean Day, and Seventh Generation at its 885 S. Cooper location. Multinational corporations and small, local businesses have at least one thing in common: garbage. All that cardboard, paper, plastic, and food waste has to go somewhere, and all too often, that place is a local landfill. Not only do landfills lead to increased pollution, landfill operators also charge companies fees. That's where Recycle Solutions comes in. The downtown-based waste management firm saves companies from paying landfill fees by taking recyclable trash off their hands. "We divert trash from the landfills and add to a businesses' bottom line," says owner Mark Huber. Located on Presidents Island, the company accepts cardboard, paper, plastic, wood, liquids and oils, metal, and even industrial food waste at their seven-acre sorting and distribution facility. "We take food waste originally intended for human consumption, like leftovers from a bakery or snack manufacturer, and move it to a cattle-feed operation," Huber says. Other items such as cardboard and paper are collected and sorted at the site and shipped to recycling companies around the world. The Recycle Solution's on-site cardboard compacter can crush 30,000 pounds of cardboard per hour. Huber says some large businesses submitting huge volumes of waste actually make money from the process. One manufacturer reduced their landfill fees by 97 percent while generating $600,000 annually from fees paid to the business by Recycle Solutions. Smaller companies with less volume may only break even. Recycle Solutions is the material recovery facility for 122 Wal-Mart stores across the region, but they also deal with smaller clients. "We take recyclable items from schools and community organizations," Huber says. "I even have a few guys who collect cardboard to bring to me." When a company expresses interest in using Recycle Solutions' services, Huber first sets up a waste audit. "For example, we'll ask a food distributor to send their compactor to us as is, and we'll sort through and see how much is recyclable. Then we'll go back and tell him what we found," Huber says. "A lot of times, it's a financial win for the company," Huber says. "So you're helping a company reduce costs, and you're helping them reduce their carbon footprint while diverting as much as possible from a landfill." Three local homes utilize the latest green products and techniques. In April, Christina Ross and her husband David Hanson held a get-together at their newly constructed Midtown home. As friends' children ran in and out of the house, their parents urged them to "keep the door shut, the air conditioning was on." "The air wasn't even hooked up yet," Ross says, "but it felt like the air conditioning was on. When you opened the door to come inside, there was a cool breeze." Ross and Hanson's home joins a duplex on Diana Street in Midtown and the University of Memphis' TERRA house project in Uptown as one of several new homes in Memphis that are more energy efficient and ecologically friendly. Among its many features, Ross and Hanson's house is constructed of aerated autoclaved concrete (AAC). The production of AAC uses only a fraction of the energy used to produce other materials. In addition, the concrete doesn't emit pollutants and keeps buildings cooler in the summer and warmer in the winter. 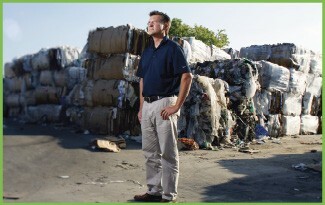 Mark Huber, owner of Recycle Solutions, helps local companies save money and reduce landfill waste. Though they had to ship the concrete blocks from a Florida manufacturer, Ross and Hanson say it was worth it. "We realized our mortgage was going to be there no matter what, but there were different ways to save on our utility costs," Ross says. In addition to the concrete walls, Ross and Hanson used energy-efficient windows, a tankless water heater, and natural light. During a recent tour of their home, there were no lights on, but it wasn't noticeable. The couple would eventually like to install a green roof, perhaps with solar panels. From the outside, the house looks conventional. Hanson and Ross call the style "Mediterranean minimalist." So why aren't more homes constructed this energy efficiently? Hanson suggests it's because builders aren't the ones living in the homes and paying the utility bills. When Ross and Hanson began planning for their home in 2004, they couldn't find exactly what they wanted. "There were certain things we wanted in a house," Ross says. 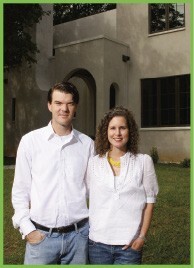 "We wanted a house in Midtown that was energy-efficient and that functioned in a modern way. That led us to 'Let's build a house.'" It helps that Ross graduated from the University of Miami school of architecture in 2000. "I think the tools are out there to do this, but it takes a lot of research," Ross says. But if the couple were to begin their search today, they might have more luck. On Diana, Mac Hopper has just completed the first of six duplexes that he is hoping will be certified under the Green Building Council's new LEED (Leadership in Energy and Environmental Design) designation for homes. "It's just a good thing to do for heating and air-conditioning bills," he says. David Hanson and Christina Roass built a more energy efficient and eco-friendly home in Midtown. Hopper has been in construction and landscaping for about 20 years and decided he wanted a change. "I was renovating old houses and thought this would be a cool thing to do," he says. "Sometimes you have to reinvent yourself." The roof reflects the heat of the sun and carries a good "Energy Star" rating. (Energy Star is a certification program created by the U.S. Department of Energy and the Environmental Protection Agency.) A gravity-fed water-harvesting system collects rain for reuse. Blown cellulose doubles the insulation of a traditional house. And some of the flooring comes from the old Skateland off Summer Avenue, which caught fire in 2006. The second story of the duplex is actually a pre-engineered frame designed by Rocio Romero. For the first floor, Hopper used what builders call a "traditional stick build" with a wooden frame. "I was trying to integrate common-sense ideas. Some of the green ideas didn't make sense from a construction point of view," he admits. For instance, Hopper is offering a solar awning as a builder upgrade. He'd like to install it, but he's trying to keep the initial price of the homes down. "It would be $15,000 to $20,000, but if you were to buy it as an investment, you would recoup your money because the heating and air conditioning from that point on would be run by the sun," Hopper says. "You don't have to carry it to the level we're doing it. It just makes sense to do this kind of stuff," Hopper says of the home's green components. "It's not rocket science." For more futuristic green ideas, the University of Memphis began planning the energy-efficient and environmentally friendly TERRA house, a two-story, 1,500-square-foot home in Uptown, in 2005. TERRA stands for Technologically and Environmentally Responsive Residential Architecture. Mac Hopper's new duplex on Diana Street collects rain for reuse. "The driving vision since Jim [Lutz, director of the FedEx Institute of Technology's Center for Sustainable Design] laid this out is how to create a house that looks just like the neighbor's house and sells for the market rate," says Mary Carroll, a student who's been involved with the project since its inception. The project is a student experiment in sustainability, with most of the building materials produced within a 500-mile radius, a focus on indoor air quality, and the county's first "gray water" system. "It harnesses all the water from the bathtub, shower, sinks, and the rinse water from the laundry," Carroll says. "Normally, that water goes straight into the sewer, but for all practical purposes, it's good water." The gray water system takes that good water, runs it through a filtration system, adds chlorine and redistributes it to the toilets. Thirty percent of a home's annual water consumption goes to flush toilets, so gray water cuts down on both water consumption and the amount of water returned to the municipal system. Students are also working on a rainwater system to capture roof water and redistribute it for subsurface irrigation. Motion sensors in the house will turn off lights if no one is in the room. Countertops will be made of paperstone, a material that looks like masonry, feels like stone, and is made out of 100 percent recycled paper. Wallboard will be sunflower-seed board made from — what else? — sunflower-seed hulls. Even household waste is not being wasted. "Everything that would be thrown away is being sorted and taken to places where it can be recycled," says Alzbeta Bowden, another student involved in the project since it began. "Everything we've chosen could be replicated in anyone's house in Memphis," Carroll says. Ways to green up your aging bungalow. I've got a lovely old Tudor Revival bungalow, but energy-efficient it's not. My power bill spikes in the summer when the AC drones and again in winter as the gas furnace blasts. I assumed my utility costs are normal, the tradeoff you expect with an older home. But during a recent conference I attended with structural engineers, I discovered otherwise as an audible gasp went up when the group learned that many displaced New Orleans residents had paid between $200 to $400 a month to cool their small (1,200- to 1,400-square-foot) homes. Wait a minute, I thought to myself, I pay that, too! I decided it was time to learn more about conserving energy in my Midtown home. So I called on architect Sarah Hadskey, owner of SAM studio, MLGW's EcoBUILD inspector Kieth Kulow, and MLGW's strategic marketing coordinator Becky Williamson to figure out where to begin. According to Williamson, my energy consumption is not unusual — not by a long shot. Memphis consumes more electricity per capita than any other city in the nation. The reasons are multifaceted: too many substandard houses, building codes that are poorly enforced, less awareness of electricity consumption, older housing stock, and lack of consumer demand. All of this combined give us the dubious distinction of being energy hogs. The first fix is straightforward: trade my home for a new one in Uptown, where builders like Populace Homes are participating in EcoBUILD, a voluntary "green building" program created by MLGW. As Kulow walks me through a new three-bedroom house on Saffarans, he points out double-paned windows that boast low-E ratings. "Low-E windows mean less heat transfer into the house," Kulow says. The walls and ceiling have cellulose insulation made of recycled newspaper and are tightly sealed. The HVAC ductwork is sealed as well, with a compound called mastic that's brushed onto duct joints, where air leaks typically occur. Williamson says a 2006 study tracking energy usage in 54 EcoBUILD-certified homes indicated 34 percent electric and 56 percent natural gas savings. While my brick home was built in 1928, it's solidly constructed, with plaster walls and a generous attic. I do have storm windows, which Kulow tells me keep the house more airtight. However, daylight seeps through my front door, the attic insulation needs replacing, and the window air units don't fit flush. On the upside, my new refrigerator received a high Energy Star rating. The estimated cost to run it annually? just $52. I've also upgraded my hot water heater. Hadskey says replacing or improving the three biggest utility users in your home — your HVAC system, refrigerator, and hot water heater — is a good way to begin lowering your energy costs. A walk through Hadskey's home in the Buntyn neighborhood brings ideas for other improvements I can make. In the attic, Hadskey points out long, two-foot-wide sheets of radiant barrier she has nailed to the upper end of the rafters. This thin foil reduces heat gain in summer and heat loss in the winter. With good air circulation, it can lower the attic temperature by as much as 20 degrees, which, in turn, keeps your house cooler. Over the 13 years Hadsky and her husband lived in their 1920s-era bungalow, they steadily made the house greener. One example is the tankless hot water heater. I tell Hadskey I had hoped to replace my gas-powered heater with a tankless too, but my plumber advised against it. Hadskey commiserated. "You really have to stick by your guns," she says, since many repairmen aren't familiar with the newer technologies. Her tankless hot water heater lies flush against the wall of the utility room. Because the wiring is older, she did have to add a new electrical panel to power it, but as she says, "it has much more capacity. When I've got company, I can run six showers in a row." It also saves money by heating only on demand. Not all fixes are big-ticket items. Hadskey ran a bead of clear caulk around all of the baseboards and windows to keep cold air out. She replaced cheap fiberglass HVAC air filters with pleated ones for more efficient air filtration. And as each light bulb burned out, in went new compact fluorescents, which use less energy and last longer. Finally, she used lots of recycled materials. Her renovated kitchen incorporated stainless-steel countertops and old refrigerator pulls, and the pantry door was refitted as a pocket door to stylishly hide the utility room. It doesn't cost significantly more to build a house that's green — or make your existing home greener. It just takes a little knowledge and know-how. Get an energy audit: Hire a professional, like Hadskey, who will do a detailed energy audit of your home. Or find a Home Energy Rating System Rater through the National Residential Energy Services Network: resnet.us. Call MLGW and schedule a free walk-through inspection of your home to identify problem areas. Calculate your energy cost: Go to "My Account" on MLGW's website and calculate how much energy your home uses. Then compare your usage to other homes of similar size and learn how to reduce energy usage. Determine ways to save: Check out the American Council for an Energy-Efficient Economy website at aceee.org/consumerguide/checklist.htm. Get a free TVA energy efficiency kit: It includes two compact fluorescent bulbs and other items to save energy at home. It's available at MLGW's website. 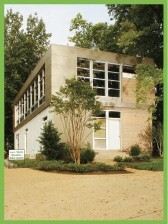 To learn more about green products and businesses featured in these stories, visit memphisflyer.com.